Update July 5th 2017: Good news the Comment Titles WordPress SEO Plugin has been accepted into the WordPress plugin repository, so can be downloaded from Comment Titles WordPress SEO Plugin or under your WordPress Dashboard : “Plugins” >> “Add New” and use the “Search Form” to search for “Stallion Comment Titles”. For support etc… you can post comments below or on the WordPress plugin repository support forum. The Comment Titles WordPress SEO Plugin replicates the Stallion Responsive SEO Themes Comment Titles feature (been part of Stallion Responsive for over 5 years). Since the Stallion Responsive code was on the old side (some of it 7 years old) I’ve rewrote the new plugins code (simpler, faster, more efficient). The long term plan is to remove a lot of features from the Stallion Responsive Theme and release them as plugins (at least a dozen plugins) so they will work with any WordPress theme. Next step is finish the 3.0.0 update of the Comments WordPress SEO Plugin to use this new plugins comment titles. Look at the comment form at the bottom of this post, note the extra field with label “Comment title”. Content added here will be associated with the users comment and can be used by themes and plugins. With the Stallion Responsive Theme the comment titles are output multiple times. 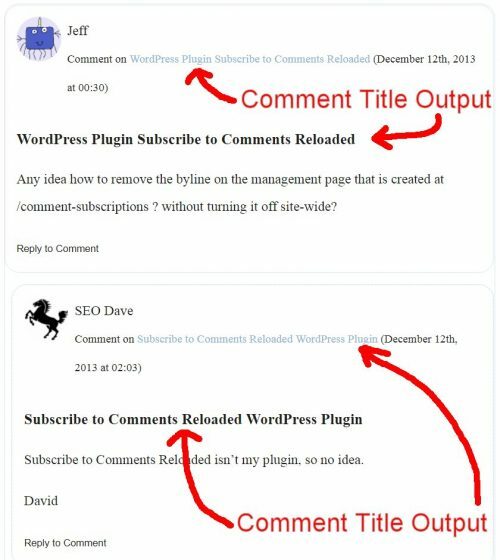 In the screenshot below the comments permalink link (within the comment meta area) uses the users comment title (the light blue text “WordPress Plugin Subscribe to comments Reloaded”) and below that the comment title is output as the comments title (the bold black text “WordPress Plugin Subscribe to comments Reloaded”). As you can see in the screenshot above all your comments could have a unique comment title associated with them. The light blue permalink text is in theme territory (can’t easily override the links anchor text via a plugin), so to replicate that feature would require theme editing (or Buy Stallion Responsive). The bold black text however is part of the Comment Titles WordPress SEO plugins code. The Stallion Responsive Theme also outputs the comment titles in other areas, but these are part of other theme features which I’m in the process of turning into WordPress SEO plugins: the next update of my Comments WordPress SEO Plugin will use the comment titles for the links to the SEO Comment Posts and the SEO Comment Posts Title Tags and other parts of the output. 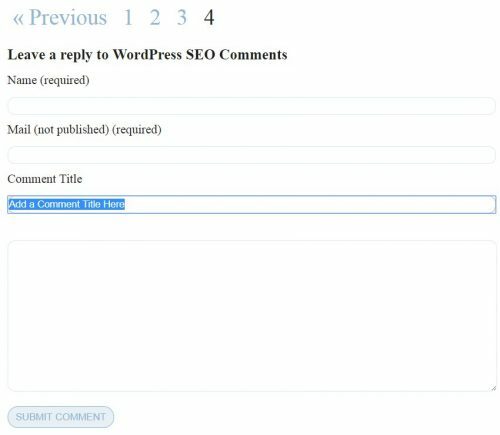 I’ve created the new Comments Title WordPress SEO Plugin so we can improve the output of the Comments WordPress SEO Plugin (it needs the comment titles to be awesome SEO wise). If you’ve participated in a forum and have added a comment under a thread with many forum scripts you can add a unique title to your comment. Although WordPress Posts are not forum threads, the WordPress comment section is user generated content (like a forum) and in my experience users do add comment titles: this site has thousands of comments with user generated comment titles. SEO wise the comment titles adds some additional text we can use to improve a Posts SEO by improving the SEO of your visitors comments. There’s an SEO issue with user comments, a webmaster might spend hours crafting the perfectly optimized text for the Posts main text, but then it’s SEO could be damaged by the users comments! On many of the Posts on this site there’s significantly more comment text than Post text! Any idea how to remove the byline on the management page that is created at /comment-subscriptions ? without turning it off site-wide? The Post the comment is on is the Comments WordPress SEO Plugin article, but the commenter asked a question about another plugin (not one of mine) and it’s unlikely they added the search engine optimized comment title “WordPress Plugin Subscribe to Comments Reloaded”. I almost certainly edited the comment and added the above comment title: I rarely modify a users actual comment text, just the comment titles (easy to edit a Comment Title, edit a comment and modify to your needs: screenshot below). Now we have comment body text which could damage (water down) the SEO of the article (the article is about the “Comments WordPress SEO Plugin”), but by adding/editing the comment title “WordPress Plugin Subscribe to Comments Reloaded” we’ve added the important keywords: WordPress, Plugin, Comments (three keywords we are targeting). You can also see from the screenshot I responded and used the comment title “Subscribe to Comments Reloaded WordPress Plugin”, adding the important keywords: Comments, WordPress, Plugin. We’ve converted an SEO problem (comments damaging the Posts SEO) to an SEO benefit (added relevant keywords). As a Stallion Responsive Theme user the larger comments are also output in their own right as SEO Comment Posts. This is also what the Comments WordPress SEO Plugin does, but the free stand alone plugin version currently (July 5th 2017: working on an update) has limited features (not as good as the Stallion Responsive Theme version). The Stallion Responsive Theme version adds a link at the bottom of larger comments (see screenshot). To understand the above screenshot. I wrote a comment on the Stallion Responsive Theme article about a meme generator plugin, here’s the comment permalink. Comments Permalink to the Stallion Responsive Theme Article : this link takes you direct to the comment, it’s a standard WordPress comment permalink, most themes output these URLs direct to comments. I gave the comment the comment title “Best Meme Generator WordPress Plugin”. The Stallion Responsive Theme version of the WordPress SEO Comments Plugin uses the comment title as the anchor text to the Comment SEO Post version of the comment at Best Meme Generator WordPress Plugin. The current output by the plugin has anchor text “View Comment”, this will be changed next update to use the comment title. Google has not only indexed the SEO Comment Post version at https://stallion-theme.co.uk/stallion-responsive-theme/?cid=3646, it’s ranked it top five for the phrase “Best Meme Generator WordPress Plugin” (direct Google traffic to a comment, pretty cool).